ment to our expectant hearts as we began both of these first 2 days together in Haiti. 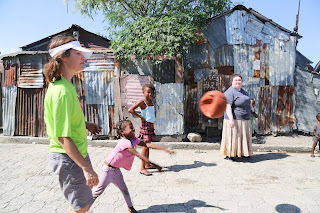 Yesterday our team first had the privilege of serving at an orphanage and school, Sweet Home. Once inside the gated entry, it had a fortress-like feel, a refuge indeed for the people inside. arms many who wanted to be held. dear women of Haiti, God IS your refuge and strength! And He is an ever present help in trouble. 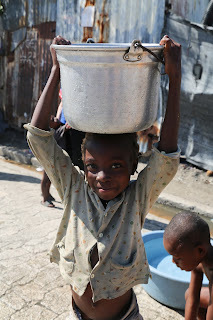 Today was water truck / water delivery day to two different locations, Cite Soleil 17 and 26. Along with delivering water we toured Hope Church and the school in Cite Soleil. We were told that because this area is so close to the ocean, it is not possible to drill a well. So a water truck has to go out every day to deliver fresh water to these thirsty people. the people of Cite Soleil 17. Church and ever present and ever accessible, will supply their every need for all of eternity. Farm, a 28 acre farm in progress with mango, sugar cane, and papaya growing currently. watermelon and many other produce options.